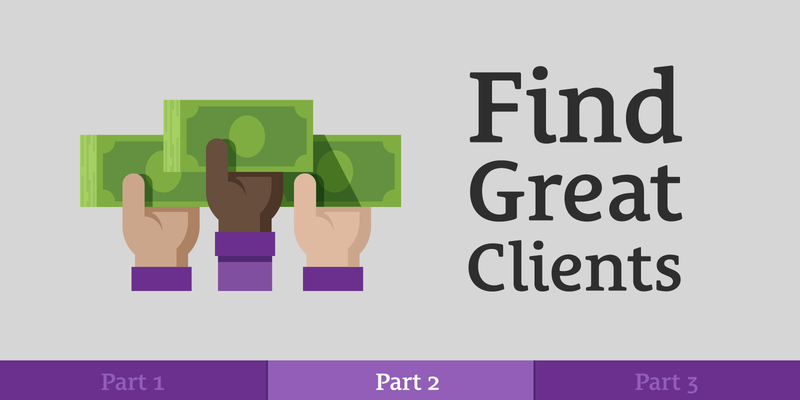 How do you find clients that pay well? First, stop saying yes to all the wrong clients. You will never convert the wrong client into a great client. The only way to get great clients is to attract them. You have to be the kind of person they want to work with. You can’t chase them, you must attract them. Chasing clients starts the relationship off on the wrong foot and leads to problems. This fights the Rule of Reciprocity. There’s only one way to get on peoples’ radar without chasing them (we talk about it in the episode). But attracting clients means attracting all kinds of clients—including ones you don’t want to work with. That means you have to filter people out. You do this by asking questions. Yes, there are bad questions to ask. We share one question you should never ask in this episode. To get great clients, you need hyper-selectivity. You must say no to all other potential clients. Even the good ones. If the client is not a great client, you say no. This advice is counter to what most other people will tell you. They will say, “Take on whatever work you can get in the beginning. You have no other choice. You live in the real world where there are bills to pay, you have to make money. You can’t afford to wait around for great clients.” Their advice is rooted in Scarcity Mindset. Justin joins me for part two of our Value-Based Pricing series. We talk about avoiding Scarcity Mindset when it comes to clients, positioning yourself as an investment instead of an expense, and what to do about your existing clients when switching to Value-Based Pricing. You cannot convert bad clients into good clients, and you cannot convert good clients into great clients. Don’t chase great clients—attract them. Don’t start off a client relationship by asking for work. Become the kind of professional that clients want to work with. Get on a specific client’s radar by providing a little no-strings-attached value. Never ask for a budget. Never work with a client that has a red flag. Start saying no by default. Realize that you will not be able to convert your existing clients to Value-Based Pricing. Value-Based Pricing positions you as an valuable investment to your clients. It’s critical to put yourself in a position where you can be selective. 02:11 Sean: Not all clients are great clients. They’re just not. You can’t convert bad clients into good clients or even good clients into great clients. We are looking for great clients. We’re not settling here. We need to reverse-engineer what a great client is so we can figure out how to attract them. How can you find great clients, and how can you get to work with them? 02:43 Justin: The key here is pricing on the value you’re delivering. When you price on the value you’re delivering, the price is going to be a no-brainer to the client because you’re charging a fraction of the value they’re going to realize. It makes business sense for them to say yes to the price you’re charging for the work that you’re going to do. 03:29 They’re the ones who are focused on making more money. There’s a subtle distinction there. Instead of saving as much money as possible, they’re working toward making as much money as possible. They’re looking to invest in people and projects that will contribute to their success and get them where they want to go to achieve their goals. The positioning is key there. If you position yourself as an investment, as someone who can help them achieve success, who is focused on helping them reach their goals, that’s the sweet spot. That’s where you find the great clients we’re talking about. 04:21 Sean: Some clients want discounts. They want things for cheap. They want you to make what’s in their mind and to revise it until they’re happy. We really want great clients. Here’s the secret about great clients—great clients want you to do the work in less time. They want the results sooner. They don’t want to do work. When you make the client pick from a bunch of concepts and you make them do work, the kinds of clients that will pay you really well are going to be bothered by that. They want the best result as soon as possible. They don’t want to have to choose from a bunch of mediocre results. You are the expert! 05:51 It’s up to the person providing the service to offer it for free. You, as the person offering the service, get to decide if you want to do this pro bono. Do you want to give this to a cause you believe in? It’s something you offer, something you give up. If you have friends who expect your services for free, then get new friends. 06:16 Justin: If a friend wants you to do work for them for free, that means that they either don’t value the work you do or there’s something messed up there with the friendship. They’re either taking advantage of you or something else is going on. A true friend is going to recognize the value of the work you do, and they’re going to be eager to pay you to do that work. Again, that’s what a friend is. They want you to succeed, and they want to contribute to your success, so they want to help you out. If someone recognizes the value of your work, they’ll be eager to pay for it. 06:59 Sean: In a lot of cases, that means saying no to your friends. They’re clients. This is a business. Them being friends is as relevant as them having a red hat. They’re a client, and if they’re a bad client, they’re a client you say no to. What’s the difference? 07:35 How can you find a client that’s going to be good to work with, and how do you even know that? You don’t find great clients—you attract them. 07:42 Justin: You have to attract the best clients, because the best clients are looking to make an investment. They’re looking for someone who’s going to contribute to their success. Let’s think about this from the client’s perspective here. Why is a client even looking for a professional to do work for them? They have something they would like to happen, and they’ve realized that they’re not equipped to make that happen on their own. 08:19 Sean: Some people don’t realize this. On the surface, the client will come to you and say, “I want you to design this thing, code this thing, build this thing.” A lot of people take that at face value. When you ask them, “What are they looking for?” They say, “They want me to build a plugin.” No they don’t! They don’t want you to build a plugin. They want to accomplish a goal. They want their clients to no longer be falling through the cracks. They want to increase their churn, their conversion rate. They have a greater goal, and if you’re not digging to find that, that’s your problem. On the surface, you might think the client wants something that isn’t at the core of what they really want. 09:08 Justin: You have to dig to find the goal. Part of that digging is useful, because it will yield a lot of useful information. You have to do the digging, because the best clients want you to help them accomplish something they can’t accomplish on their own. They’ve recognized you as someone who can help them do that. They’ve recognized your experience, your past work, your skills, and your ability to execute on those things. 09:43 Sean: Can they just read minds? How do they know or recognize all of these things? 10:42 Sean: You’ve got to show. Don’t tell. 10:49 Justin: When you go out into the world and you say that to people, think of how you would react to someone saying that. If someone came up to you and said, “Hey, I’m really good at this,” out of the blue, it almost has a chilling effect. It seems kind of suspicious. That’s why it’s so critical to attract the clients. 11:19 Sean: I introduced this episode by asking the question, “How does one find clients?” The title of this episode even says, Find Clients That Pay What You’re Worth. I did this because you want to give people what they want in the headline. You know what they need, but you have to give them what they need in a package of what they want. What people want, search for in Google, and think in their mind, is, “I want to find clients. I don’t have clients. I don’t know where the clients are, so I guess I have to go find them.” We know that the solution is attracting clients. 11:59 We know that when you go find, chase, or cold call clients, that’s fighting the Rule of Reciprocity. It’s also causing problems, where you are asking the client the favor of working with you. “Hey, will you work with me?” You’re asking of them. When you start off a client relationship with an ask, you’re starting off on the wrong foot. It will affect the entire dynamic of the relationship throughout the project. Instead of them defering to you and coming under your process, they’re thinking, “I’m already doing him the favor of working with him,” from the beginning. 12:40 Even though I say, “Find clients,” that’s because that’s what most people want. That’s probably why you listened to this episode. You were thinking, “I need to find clients.” You don’t need to find clients. You need to attract clients. This is how you get a mate. This is how you get friends. When you’re chasing, you decrease your chances of finding someone who is the kind of person you want to be with for the rest of your life. The more effective, albeit longer, plan, is to become a person that people want to be around. Become a person people want to spend time with. Become a person that people like, and you’re going to find friends and a mate. It’s the same with clients. You need to become the kind of professional that clients want to work with, and that takes time and patience. 13:32 You have to position yourself as someone who is knowlegable. That means writing, putting out case studies, sharing your process, sharing testimonials, showing how you work, and even teaching how you work, to let prospective clients know that you’re someone who can be trusted. 13:50 Justin: You need to build awareness. Make sure that your potential clients are aware that you exist, but don’t go ask them for work. Don’t inject yourself into their situation and assume that they have a project for you at that time. The timing just isn’t going to happen. Demonstrate to the world that you do great work, you can execute, and you can complete this work with clients to achieve goals and contribute to their success. Demonstrate that you know your stuff. 14:47 Sean: To a lot of people, this sounds scary. It sounds like it will take way longer than they have time for. They don’t want to sit around and become someone other people will want to work with—how do they know anyone is ever going to find them? They don’t know when it’s going to happen. They feel like if they go out and they chase clients, they go on these 98 Designs websites and all these places where they can tell clients, “I want to work with you!” That feels like action. That feels like getting closer to getting a client, and they can see it. I’m guessing, Justin, that you’re going to say that those are not the kind of clients you want to have? 15:28 Justin: Exactly. They’re not. They’re the ones who are looking to stick to a budget and save as much money as possible. They aren’t the ones who are making investments. They aren’t the ones focused on success, quality, and goals, the things you’re probably focused on. It’s a mismatch. The goals aren’t aligned, the incentives aren’t aligned, and it’s a bad match. It does feel like you’re making progress when you’re chasing clients and you’re drumming up work, and in a way, you are. You’re going to get clients, but they’re going to be bad clients. 16:09 They’re going to be the kind of clients who won’t contribute to your success, the kind of clients that continue to mire you in the spot where you are now. They’ll prevent you from growing and from being where you want to be. It’s tough. It’s going to take time, yes. It’s going to take effort, yes. It’s not going to yield an immediate return, that’s true. This is hard. That’s why everybody isn’t doing it. Most people are taking the quick and easy path to driving rates down and doing as much work in as little time as possible regardless of the quality. 17:07 They’re looking to get as many little clients as possible that aren’t ideal, scrambling around to keep the lights on and eking out a living. I was going to say, “That’s fine for most people,” but it’s not really fine. It’s the path a lot of people take, and that’s why the industries we are talking about, like the development and the design industries, that Value-Based Pricing applies to, are in the state they’re in right now. That’s why the landscape looks the way it does. The quick and easy path is not the path to the level of success we’re talking about here. 17:56 Value-Based pricing is the path to the next level of success, the next level of great clients and being able to focus on what matters. It sweeps away all of this arbitrary overhead and these arbitrary rates, all of this stuff that has been bothering you, that doesn’t quite make sense or doesn’t feel right. That’s why we put so much time and effort into figuring out what the problems were, how to address the problems, and putting together this course. We’ve invested two years in this because it is such a hard problem to solve, but we’ve solved it. 18:47 We’ve solved it in a way that’s win-win for everyone involved. It’s a win for you, it’s a win for your clients, and it makes the work you do incredibly better. That’s why we’re so excited to get this out there and see what it does for people. 20:02 Justin: How do you get from where you are now to where you want to be using Value-Based Pricing? We have a whole module of the course dedicated to transitioning from where you are now to where you want to be, to doing Value-Based Pricing full time. It is a transition, and there are a lot of different paths to that. There’s the path of doing the Overlap Technique and getting a day job, giving yourself the freedom to say no when you really need to say no. There’s the slow transition where you fulfill your existing client obligations and you transition to better clients under a Value-Based Pricing model. 20:46 There’s a lot of detail in the course about this. If you want to use Value-Based Pricing and you have a specific client in mind that you would like to work with, how do you work with them? How do you get on their radar? I’m not just talking about people in your industry in general, but specifically this one client that you’d like to work with. Provide your desired client with a little bit of value with no strings attached. 21:20 Sean: Some people are thinking, “I get it! I find a client I want to work with, and I reach out and I say, ‘Hey, I saw your landing page. I’m a copywriter, and here are six different things you can adjust to make your message more clear and increase your conversion rates. If you want to hire me, like I said, I’m a copywriter, so here’s my website. Reply to this email! I’d love to work with you and take your money!” That’s not what we’re talking about. No strings attached completely. If you have a client you want to work with, this is the secret, the trick, the only way to get on their radar without actually chasing them. 21:59 If you’re asking them, “Hey, will you work with me? I am a person that does this. I want to be hired. Work with me, and I want you to be my client,” that’s chasing them. What you can do is just provide value. You can go to anyone in the world, any person, whether they’re someone you want to work with or not, and you can give them value. All you do is you say, “I noticed that you have this landing page. I love what you do. I have a few suggestions for you.” Boom. Aaron Dowd has done this. He’s the podcast editor on the seanwes network. He’ll reach out to someone and he’ll edit things for them or he’ll give them tips on how to get better sound for their podcast. 22:40 That’s it. He doesn’t say anything else. That puts you on their radar. You haven’t asked for anything in return. You’ve simply given them value. You’ve primed the machine. If they want to work with you, then they come to you, and through that, they come under your process. Your clients aren’t doing you a favor if you don’t ask for anything. 24:02 Sean: He’s being modest. To me, it was such a huge improvement. 24:08 Justin: I put that in the forums. I made a post and said, “If you’d like the chat to be it’s own stand alone thing and look this way, which saves space, follow these instructions,” and I put all the instructions in there. That was it. 24:25 Sean: Justin didn’t even reach out to me. He did it for the Community. 24:30 Justin: I just did it for other Community members. I put it in there and showed the steps, no strings attached. 24:41 Sean: Of course, I noticed, and I hadn’t ever heard of Justin before. He had just joined the Community and we didn’t know each other. As we talked about in another episode, that led to a much larger project to the tune of $50,000 and other projects for years after that (Related: e145 Getting Started With Value-Based Pricing). Now, he’s on the team. That was a perfect example. 25:05 Justin: How do you avoid chasing clients but still get on their radar? Provide value, no strings attached. This is critical—people will know when there are strings attached. People can sense that. Think about it. In all of the situations you’ve been in with sales people that seem skeezy, something doesn’t feel right and you can sense that. You can sense when people have expectations, and it’s a really bad feeling. That’s the last feeling you want associated with you, so the no strings attached piece is critical. Just provide some value, period. 26:05 Sean: That’s a good way to get on people’s radar without chasing them, but the general strategy is to put out case studies, to put out your process, and to show testimonials from past clients. This is something we talk about more in the course, and we’ve talked about this in the pilot program we’ve been going through over the past half year. You can use social media to get on the radar of clients, and of course that means auditing your personal social media. You shouldn’t use that account with your business, unless it’s talking about things you want to work with clients about. 26:41 Let’s talk about filtering clients with your questionnaire. This is the first road block, the first hurdle the client has to get over, this questionnaire that you put up on your site. It asks a bunch of questions, and first of all, it gets rid of the people who are just looking for something quick. If they have to put in any time investment, they’re gone. You get rid of those immediately. 27:20 Justin: Great clients are the ones who are going to be willing to put in effort. You don’t want an entirely passive client because you don’t want someone who’s not invested in the project. You want someone who’s looking to make an investment in you to contribute to their success, and you want them to be willing to do their part. That all starts with this questionnaire. The questionnaire is somewhat in depth, and it’s not just a few questions. It’s a number of questions. We’re not talking about multiple choice. They’re typing things out, explaining their situation and what they want to achieve. Just the act of filling that out demonstrates that this client is invested enough in you and their project to fill this thing out. That filters out so many bad fits right off the bat. Don’t ever ask for the client’s budget on the questionnaire, because it is not relevant. 28:46 You think it’s relevant, but the budget question inherently has so many problems. The first thing it does is it puts the client in the mindset of money to you, the professional. You have now positioned yourself as an expense to your client. When you follow Value-Based Pricing, you are positioning yourself as an investment to your client. Expenses are things that people want to get down. If you want to have more money each month, there are two ways. You can make more money or lower your expenses. 29:22 When people talk about expenses, it’s about lowering your expenses. No one ever wants to increase expenses. If you are positioning yourself as an expense, you automatically lose, because you’re in the category of things your client wants to minimize. You’re working against your goal of making more money. It simply won’t work. You want to position yourself as an investment. When you ask the client, “What is your budget?” You immediately make them think about money to you. You have to think about the Rule of Reciprocity, which is to give value first, then ask. 30:32 We say, “Right now, we’re focused on figuring out what your goals are, because I want to make sure that I am able to make you successful. Before we talk about my compensation, my focus is on helping you be successful.” If the client balks at that, they already see you as an expense. If they say, “No, no, tell me what your rate is. Tell me what you charge. I want to know what the money is,” they’re a short-sighted client. They’re not even interested in the success of their own project. They already see you as an expense. 31:07 Immediately, they are disqualified at this point. Throughout this process of Value-Based Pricing, there are going to be red flags. I always say that red flags are like roaches—for every one you see, there are 50 you don’t see. This is why red flags are so critical. If you see a red flag, this disqualifies the client. Remember, the point of a filter is to keep the bad out. Your job is not to convert bad clients with red flags into good clients; your job is to filter them out and disqualify them. 31:43 This is the job of a filter. Think of a water filter. You don’t want to let the junk through into this glass you’re going to drink from and say, “How do we convert all of this garbage in here into something we can drink?” No. Keep it out in the first place. That’s the point of a filter. 32:05 Justin: The questionnaire is such a fantastic filter for this. It shows that they’re invested enough to fill out the questionnaire, that they’re willing to put in a level of effort that indicates that they’re serious. The questionnaire should be very success-focused. It should be all about what success looks like for this project. What information do you need to help the client be successful? The best clients are going to recognize that. They’ll see that the questionnaire is entirely focused on how you can contribute to their success, and that’s going to be a positive indication for them and for you once they fill that out and answer all those questions. 33:05 Sean: I know that this is a mindset shift for a lot of people. Believe it or not, there are clients out there who appreciate the fact that you are focused on their success. They appreciate the fact that you’re more focused on their goals and making them successful than you are worried about your own compensation. I know that this is hard for some of you, because all you know is clients that treat you like a commodity. All you know is positioning yourself as an expense. All you know is asking for budgets and having clients wonder why you don’t ask for their budget. If this is all you know, this sounds really strange to you. 33:46 You can fall into thinking, “Aren’t clients going to think I’m weird? How am I ever going to get clients if I don’t ask them for their budget or tell them how much this is going to cost before we even talk about the project?” Those are not the clients you want. I need you to picture a pie chart with all of the potential clients in the world. Let’s say that we split it up into eight pieces of pie. Seven out of eight of those pieces are clients you don’t want. The small slice, the one slice of pie in this pie chart, are the clients you want. Your job is to filter out all of the clients you don’t want. You have to imagine that something bad is in this pie. 34:34 In seven pieces of of the pie, someone said, “I put something bad in seven exact pieces.” You job isn’t to get one of those pieces and say, “How can I convert whatever’s bad in here into something that’s edible?” You want to find the one that’s edible. You want the good clients. The whole point of this process is to filter out the vast majority of clients that you don’t want to work with. A common theme throughout all of this is saying no. You have to say no way more than you say yes. 35:02 Most of you have a default of saying yes. Your default needs to be saying no. Yes needs to be the exception, because yes is expensive. Yes, I’ll do that revision. Now you’re working more hours for free. Yes, I’ll work with this client that has red flags. Now you’re going to have headaches for weeks, if not months. You’re going to work overtime, and you’re going to get less sleep. You’re going to be stressed. Your spouse is going to be frustrated because you’re not fully present. Yes is expensive, and you need to protect that yes. 35:34 Justin: Yes should be rare. Yes should be considered, thought out, and very, very rare. Going back to the state of the industries, the race to the bottom, the hourly rates, flat rates, lowering prices, and trying to compete on price—all of that is a symptom of saying yes too much. All of that is a symptom of saying yes to the wrong clients, the wrong projects, and the wrong kinds of work with the wrong kinds of incentives and the wrong kinds of motivations. The best clients here are looking to make an investment in you, because doing so is making an investment in their own success. If you are not success-focused, if you’re focused on budgets, price, or anything other than their success, they won’t view you as an investment. 36:35 Viewing you as an investment is critical to the whole relationship. If they view you as an investment, they’ll treat you more like a peer and a partner. They’re going to want to work with you as if you were part of their team, because you’re focused on their success and achieving their goals, which is the exact same focus and motivation that they have. That goal alignment is exactly where the best work comes from. It’s where the best projects come from. It’s where the best relationships with your clients come from. That’s what you want. Your questionnaire is the first step to filtering out the clients that don’t fit that description. 37:26 Sean: You also avoid opening yourself to comparison. When you’re not talking about the money right off the bat, the won’t think of you as an expense to compare to everyone else. Everyone else they’re comparing you with are people who put up rates, ask for budgets, and talk about money at the beginning of the project. That’s the only way you can be compared with them. All of the people you would be compared with are commodities. They’ve positioned themselves as commodities, as expenses. It’s a different approach, because we’re going for the select, great clients and we want to filter everyone else out. 38:20 Justin: Value-Based Pricing has five main stages. The first one, that we’ve been talking about here, is attracting clients. You want to attract clients. Don’t chase them. That’s stage one. Stage two is the initial filter, the filter with your questionnaire. That’s going to get rid of a huge percentage of bad fits. Having that questionnaire will save you a ton of work and time that you’re wasting right now. If you don’t have that barrier in place, you have to deal with these emails, phone calls, and all of this stuff manually. That takes a huge amount of your time and effort that could be put into the actual work. 39:06 Stage three is value discovery. That’s when you engage with a potential client and you figure out what the goals are that you want to achieve and why they have sought you out. What are we trying to do here? You dig until you find the actual goals they’re after. They’re very rarely out of the gate. They’re usually things you have to dig for. What do you want to accomplish, really? Why are you wanting to work with me? After you identify that, you discover how much value there is from that client in achieving that goal or solving that problem. What value do they place on that solution, on your work? 40:05 Sean: We’re not determining the value, we’re discovering it. It’s a very strategic process you go through to uncover it. Think of it like you are a gold miner or an archeologist, and you’re digging and uncovering this buried treasure. You’ve got your brush, and you’re brushing away the dirt from a chest of gold. You’re uncovering the value. You’re not defining it. It’s something the client is defining. 40:37 Justin: It’s critical that the client defines it. We’ll talk about that more. Once you’ve discovered the value, you can put together a proposal. You can tailor your solution to the goals they want to achieve, and you can put together a price with the tools we have available in the course. Present that to them. Say, “Here’s the solution I believe is going to work best for your situation, and here’s how much it’s going to cost.” That cost, again, is going to be a fraction of the value they’re going to realize from the work you’re going to do, so it’s a no-brainer decision. 41:19 Stage five is actually doing the work. You sit down, you focus, and you do the work. The process up to this point has provided you with this rich dialogue with your client, so you’ll have much more information than you’re used to. You’re going to be able to work in such a way that it’s toward their goals, their actual goals, and contribute to their success in a way that you never have before. The work itself will be so much better because of the process supporting the focus on success and achieving goals. 41:59 Then there are the partnership aspects of the relationship, where it’s not an adversarial relationship, but it’s one of peers working as a team toward a common goal. 42:11 Sean: That’s the biggest thing. It’s so different from any other project that you’ve done before. Both of you, you and your client, with the other broken pricing models, are incentivized to finish the project and get it done with the least amount of work possible in the least amount of time and just be done. Both of you are incentivized that way. With Value-Based Pricing, it’s completely different. Your goals are aligned. The goal is to maximize the amount of value to the client. This means that if you uncover ways to create more value to the client in the process, while you’re doing the work, they’re motivated and incentivized to have you do more work. 43:00 The way all of this is arranged, they benefit from it and they get more value from it, so they want you to do more work. It’s a benefit snowball that leads to more and more good things. It’s worth going through all this process and filtering out the bad clients, because if you get that great client, they could be the person you end up doing more and more projects with because it’s a no-brainer for them. Maybe you discover that you can make a system even better, and they want to work with you because of your track record and because they know that the value they get from that is always going to be way more than what they’re paying you. 43:50 Justin: It all goes back to the investment piece. You need to position yourself as an investment. The best clients are going to think of you as an investment. As long as the return on the investment is there, they’re going to continue to invest in you, and that’s exactly what you want. 44:16 Sean: Sam is wondering, “Can we apply this to existing hourly clients? Should we send them a questionnaire? How can we make the transition?” Justin, what would you say to Sam? 44:29 Justin: The existing clients you have view you as an expense, so you’ll have to say goodbye to them. They do not have the mindset, the approach, or the focus on the right things for Value-Based Pricing to make sense for them. 44:47 Sean: This is your own responsibility. You took them on in the first place. You set that first expectation. You started off the relationship on a certain foot. Try going up to a stranger and saying something to them, and then trying to convince them that that’s not really what you wanted to say and you don’t really think that about them and also, you do something completely different and they should know something different about you. That first impression was made. In 99.99% of instances, you are not going to be able to convert your existing clients to clients you work with using Value-Based Pricing. 45:38 Think of that pie again. The reason I say 99.99% is because, technically, it’s not impossible, but winning the lottery isn’t impossible. It’s so improbable that we don’t find it productive to even teach how that can possibly happen. It’s like the bad pie. Don’t spend your time trying to convert bad pie into good pie. Just find the good pie! 46:08 Justin: So many stars would have to align and so many things would have to be so improbably positioned that it just doesn’t happen. It’s unfortunate, because some of you have relationships with clients that have spanned years. You have a rapport and a history with them, and it might even be a productive and a fairly good one, but Value-Based Pricing is about reaching that next level and making huge changes for the better of your process, the way you work, the way you attract clients, and the way you do everything professionally. With that change, your existing clients aren’t going to be on board or understand that, and they won’t be interested in understanding. 47:11 Sean: You’re already a commodity to them. You’re in the expense bucket. 47:19 Justin: You’re someone with whom the whole relationship is based on things that are antithetical to Value-Based Pricing and the way it works. It’s so hard to explain in a nutshell, which is one of the reasons we made the course. There is so much misaligned with goals, mindsets on both sides, and historical precedence, that it’s very difficult to shift from being in that client-professional relationship to being in more of a peer-partnership relationship. 48:04 Sean: It’s totally different. If you think of a business partnership, you go into business with a partner and the partner says, “We could shift in this direction, develop this product offering, or solve this problem.” Think about your relationship with them. You’re in this with them. If things work out and go great and they make a bunch of money, you do, too. You’re a partner with them. You’re incentivized to help them and create this thing with them, and that is the kind of partnership we’re talking about. It’s not a hierarchical thing where this client is the dictator, they’re telling you what to do, and if they don’t like the result, it’s no good. 49:34 Justin: It is a transition. It’s not an overnight thing. It’s a process, and it’s somewhat gradual. 49:41 Sean: I’m thinking of the Scarcity Mindset aspect of this, touching on the Overlap Technique. 49:49 Justin: There are so many different situations that people are in. Some people have shorter projects, and they’re constantly finding new clients. Because the projects are shorter, they go through a larger number of clients, and if those people start saying no to them, how can they keep the lights on? The answer for those people, in a nutshell, is the Overlap Technique. Find a day job that covers your expenses and frees you up to say no and be selective about the clients you take on. It enables you to put the time investment and resource investment into attracting the right clients. 50:36 Others of you have client relationships that are longer. You might have a project that is months or even years long, in some cases. You’ve got existing obligations that you need to fulfill, and we’re not in any way advocating that you sever ties to your clients when you have an existing agreement with them or obligations to fulfill. You continue. Fulfill those obligations. 51:10 Sean: Sam is saying in the chat right now, “So we do the Overlap Technique from hourly clients to Value-Based Pricing clients?” I said, “Not quite.” Working as a commodity or an expense, you’re positioning yourself as an expense. You’re attracting the kinds of clients who see you as an expense. That will not lead to Value-Based Pricing. It won’t lead to the kind of clients that you want who will be a great fit for your process. Ideally, you don’t want to continue working as a commodity, at an hourly rate with existing hourly clients. 51:47 That’s why we talked about the Overlap Technique. Get a day job that is unrelated to your industry. I’m serious here. The day job is purely functional. It’s only function is to cover your baseline expenses, and that’s it. You don’t need to do more than that, and you certainly don’t do less. Don’t get a day job that covers 60%. Any amount of pressure you put on yourself to get clients when you’re still not ready and you’re still in Scarcity Mindset, when you’re tempted to take on clients that will be anything less than a perfect fit, is not good. You can’t have the day job cover 50% of your bills, 80% of your bills, or 90% of your bills. The day job needs to be in a different industry so it doesn’t drain you of the kind of creative energy you need to do the kind of work you enjoy. 52:47 The right type of day job will charge you. You’ll come home charged to work on this stuff in the evenings and weekends. If that is not the case, you are in the wrong day job. You need to quit tomorrow. You need to quit yesterday. You need to get a day job that is completely unrelated and covers your bills, and maybe that means lowering your living expenses a little bit. Cover your bills because you need to protect your selectivity. All of this effort and this work is worth it to get to the point where you’re working with clients that want to pay you what you’re worth. They want to give you money, to give you projects, and they don’t want you to do revisions. They don’t want you to cut corners. 53:28 They want to do more projects with you and they want to refer you. All of this is worth that. Justin is talking about if you have existing contractual relationships with a client. You’re working with someone on an hourly basis, and you’ve got six weeks of a project and you’re halfway through, you need to finish your contractual obligations. We know it’s not ideal and you can’t do Value-Based Pricing with them, but you have a contract. Finish the rest of the work, whether that’s three weeks or three months, and move on. Then, start from ground zero. You are building this new foundation. It starts with a day job, with covering your bills, and then you go through this process we’re talking about. 54:10 You attract the kinds of clients you want to work with. You start positioning yourself as a professional. Yes, this is going to take time. You need to be able to take as long as it takes to attract the kind of clients you want. You cannot afford to be in Scarcity Mindset, and that’s where the day job comes in. 54:30 Justin: The day job is a launch pad. Everyone comes to see the rocket. Everyone is excited about building and launching the rocket, and the launch is the thing, but without the launch pad, the launch doesn’t happen. You need a solid foundation that supports what you’re trying to do, that doesn’t get in the way. It’s not glamorous, but it’s critical that the launch pad be solid and reliable. It can’t just be a launch pad that supports 60% or even 90% of the rocket. It has to support the whole thing to support the launch. It can’t be halfway or part way. 55:18 In a lot of cases, it’s going to take the form of a day job, and in other cases it might take the form of you having a lot of savings. That’s fine, too. The key is that whatever it is that supports you and covers those base expenses frees you to say no when you need to say no. It frees you and enables you to be selective about the clients you take on. 55:49 Sean: I know a lot of people are still struggling with this. You need to see working as a commodity as completely in the opposite direction from working as an investment. There are only two directions. You can work as a commodity, where you’re going down to the discount bin. The only way to win as a commodity is to underprice your competitors, and you’re open to competition. You aren’t when you’re an investment. The other way is to increase the value for your clients. Picture whatever highway is nearest to you. There’s East and West, North and South, left and right. You’re going one direction or the other. Continuing to do hourly work is not the Overlap Technique. 56:38 You are not getting closer to the point where you can jump off and start doing Value-Based Pricing and start positioning yourself as an investment. You are driving on the highway in the opposite direction, taking you farther away. What I’m talking about with the Overlap Technique is to stop the car, stop working as a commodity, and if you need to drive to the next exit on the highway—i.e., finish your contractual client obligations—then do that, but pull off and stop the car. Start working at the gas station at that intersection and save up enough money to put gas in your car and go the opposite direction. 57:18 We have this comment right now in the chat that says, “I feel like it’s really hard to get a day job that isn’t related to your expertise that’s enough to pay the bills. Since you aren’t an expert, you’ll probably be in a very junior position.” That is a fact. If you don’t have multiple other skills where you’re at some level of proficiency, it’s very realistic that you’ll be at a junior position in your day job. It doesn’t matter. With your day job, the only thing that matters is that you are not draining the kind of energy you need. 58:36 That might mean that you cut Netflix and eating out, that you lower your expenses. You move to a smaller apartment for this next year or these next two years. Lower your expenses, get a day job where you’re in a junior position, and maybe work a little bit more. You have to be serious about this. How much do you care about doing the work you like with clients that are a joy to work with, who pay you well? It is going to take investment, but it’s totally worth it. You absolutely can do it, and it is worth it. 59:14 Justin: If there was a quick and easy path to what we’re talking about, to having great clients and having what you make increase with the quality of the work you do without arbitrary caps, we would be sitting here explaining that quick and easy path to you in detail right now. There isn’t one. We spent two years figuring out that there isn’t one. This is the path. It requires sacrifice, and it requires effort. It requires dedication and motivation. If you want to get to the place we’re talking about, this is how you do. It’s not all sunshine and roses, but it’s well worth it. It’s a difficult path, but it’s definitely doable. It won’t be 100% the things you want to do, but it will get you where you want to be eventually. Should You Keep a Day Job in Your Industry? 1:00:48 Sean: Moataz says, “I’m in a design day job right now that’s a contract and pays well enough to be able to freelance on the days I’m not working. To me, it’s an okay spot. It doesn’t drain me too much. Should I still quit it and get in one that’s not design related?” There are two options. He’s saying that he wants to do design, but it’s also his day job. You need to evaluate whether or not the work you’re doing to pay the bills is compromising your professionalism. Are you working in the kind of process you want to be working in? Are you positioning yourself as the kind of professional you want to be operating as? 1:01:35 If not, you’re cementing an unprofessional process. You’re cementing your relationship as someone who is not a professional. Think of the highway and that is going in the opposite direction of where you want to go. That’s why I say that in most cases, working in the same industry in unprofessional circumstances where you’re not following the kind of process you want to be doing and you’re not pricing on value, you’re essentially commoditizing yourself. That could be a public facing relationship, but even if it’s private and fully contained, where you don’t share any work or any process, you need to evaluate for yourself if it is affecting your morale and/or cementing unprofessional processes that you’re going to have to undo over years after you get out of that environment. It’s not impossible to make a day job in your specialty work, but it’s something you need to be very cautious about. 1:02:38 Justin: Everyone has a unique situation. We’ve run into this a lot developing the course, because it has to apply to a wide audience and a wide variety of situations, professions, and industries. We’ve tried to be as specific as possible in the course and give you actionable steps, getting into the details as much as we possibly can when it makes sense, but in some places we’ve had to generalize. There is a philosophy and a mindset behind Value-Based Pricing, a core process. We have a lot of general rules that are there for a very good reason. We’ve put a lot of time and effort into making sure that the things we’re saying aren’t just because they sound good. 1:03:44 We’re saying this because we’ve put in the time and the effort to figure this stuff out. We’ve tried different things and put ourselves in situations to figure out what does and doesn’t work with clients. We’ve had a lot of discussions with a lot of different professionals, many of them in the Community, about their situations, what’s working, what’s not, and why. If you want to go down this path you should take what we’re saying very seriously. That said, you know your situation best. The key with everything we’re saying is that you are honest with yourself. 1:04:41 Take a hard look at your situation and be 100% honest with yourself about where you are with whatever job you have, whatever path you’re on, and whatever situation you’re in. If you’re in a spot where a certain kind of day job makes sense over another one, maybe it does overlap into your industry or whatnot, you’re the one who knows that better than we ever will. The key is to be honest with yourself. If that day job is sapping your energy, affecting your morale, compromising your professionalism, or is having any kind of detrimental effect on you going down the path of where you want to be, you need to be honest with yourself and you need to cut that off. 1:05:40 Take a different path. Find a different day job. That’s central to what we’re talking about here, and we go into a lot more detail about all of this in the course. That’s the key. Be honest and take all of this stuff we’ve put together, this stuff that we’ve taken the time to research, test, and refine in the course, and apply it to your situation honestly. 1:06:13 Sean: If you are interested in signing up for the course, you can find it at ValueBasedPricing.com. Justin and I will be launching a new Value-Based Pricing podcast on the seanwes network, and you can also find that at ValueBasedPricing.com.